Meet Ugly, an odd-looking duckling rejected by everyone except his mother in Honk, Jr., a contemporary adaption of Hans Christian Anderson’s Ugly Duckling. Separated from his farm and trying to find his way, Ugly encounters an array of characters who teach him important life lessons through delightful songs while his loving mother searches for him. 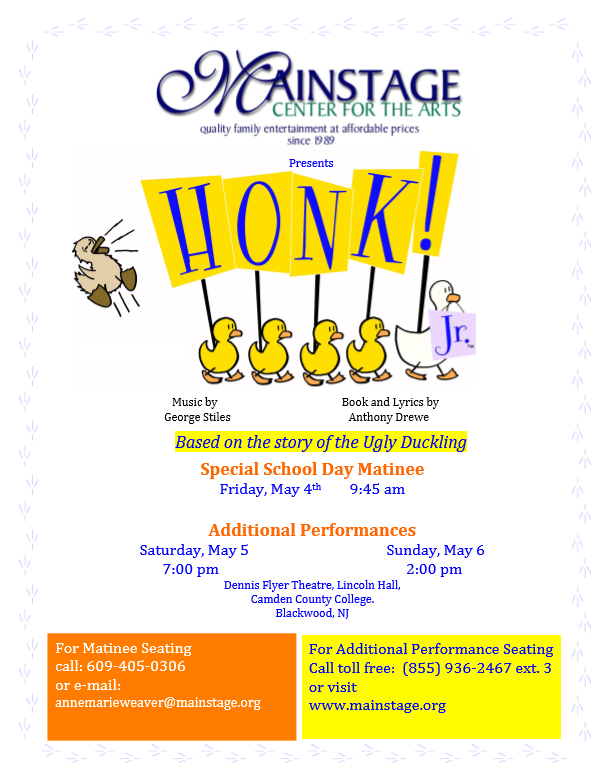 Mainstage Center for the Arts Musical Theatre Company presents Honk, Jr., May 5th, 7:00 p.m., and May 6th, 2:00 pm in the fully accessible Dennis Flyer Theatre, Lincoln Hall, Camden County College.